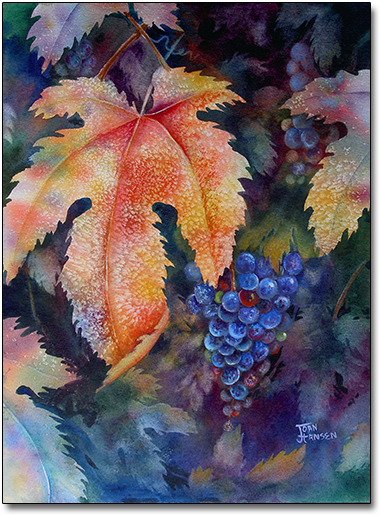 This watercolor and gouache painting is another in the grapevine series. The painting was started with an abstract wash of color. As the first layer dried, the artist sprinkled salt on the wet paint creating the unique texture in the leaves. After this layer dried, the salt was brushed off, and deep muted tones were painted in the negative space. When this layer dried, the background images were lifted off, and the grapes were painted with watercolor and gouache.